Not strictly a walking tour, we actually began the day at the Tayelet / Haas Promenade where we did an overview of the Old City and the surrounding area. I gave them the lay of the land, pointing out all the important sites we could see. When we finished that, they drove us over to park in Mamilla Mall. On our way, I gave them a quick rundown of the various periods of history in the land of Israel. I also had a visual timeline handy (like this one, but in English) that they could refer to at any point in the day, if they needed to. As we walked through Mamilla, I described the history of the area and how the new mall’s architecture brilliantly altered the way people access the Old City. From there we walked up to our first main stop, Sha’ar Yaffo / Jaffa Gate. Sha’ar Yaffo offers a great starting point to discuss the various eras that the Old City has gone through. I pointed out some of the design work and defensive features. I discussed some of the other names of the gate, some juicy stories related to the gate, and little known facts about it. I also showed an old picture of what the gate looked like over 100 years ago. Finally, we also discussed the traditional layout of Ancient Roman cities, with two main crossing roads meeting in the middle, how that layout played out in Jerusalem and how those two roads are still visible as major arteries running through today’s Old City of Jerusalem. From Jaffa Gate we followed the road around, past the “Tower of David” (in quotes because it is misnamed), and into the Armenian Quarter. The smallest of the four quarters in the Old City, it is also the quarter about which I know the least. I did give them a bit of its history as we walked through, though we didn’t really stop to see anything in particular. We continued down to the Jewish Quarter, making our first stop in the exposed part of The Cardo. I discussed the history of the location, and what it looked like, and then we proceeded inside to the covered part. We stopped at the copy of the Madaba Map, and then moved to the mural and re-creation part where you can see what the old market street looked like. My favorite part of the Cardo is not that often visited, but as you get close to the Arab shuk, on the left side, there is an excavated spot where you can clearly see three different strata from different eras. I like to take people there and go down the steps so they can understand the concept of how stratigraphy works in archaeology. 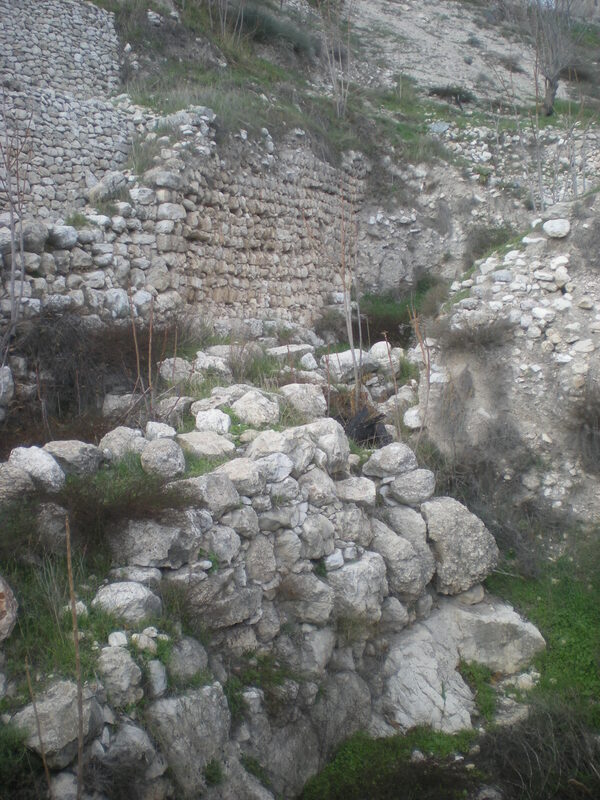 Ancient Canaanite wall around Jerusalem (named Shalem then), located in today's City of David. From there we went to one of my favorite things in the entire Old City, because it is one of the oldest pieces that you can see within the current Old City Walls. It is the area known as the Broad Wall, and it dates back to the time of King Hezekiah (late 8th – early 7th Century BCE). Next up was the square outside the recently rebuilt Hurva Synagogue. 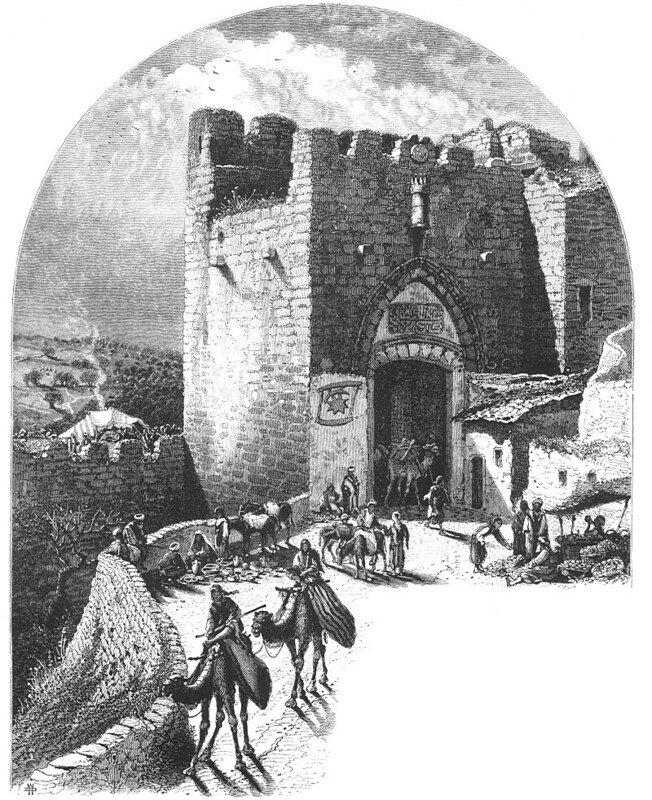 It offers a great window onto Jerusalem in the modern era, from the mid 1800s until the present day. A quick lunch of falafel in the Jewish Quarter, and then we headed down towards Sha’ar Ha’Ashpot / the Dung Gate. We stopped on our way down the steps to discuss the Temple Mount, and the engineering of Herod’s expansion of it. And then we exited the Old City and went to Ir David / The City of David. We started with an overview of the entire site from on top of the Observation Tower, then worked our way down through various areas on our way to the water system. One spot we stopped along the way was at the ancient Canaanite city wall. From there, we entered the “Warren’s Shaft” water system, and went through Hezekiah’s tunnel. At the other side, I showed them the remains of the Siloam pool, and the ancient Roman road. Then we walked back up the other side of the Roman road to emerge near the Givati parking lot excavations. We walked back up into the Old City and paid a visit to the Kotel /Western Wall. I gave them time to do their own thing there, and then we headed out the other side of the Kotel plaza, and into the Muslim Quarter, our third of the day. Our first stop was the Cotton Makers Bazaar and the gate that leads from there right onto the Temple Mount. That gate is only open to be used by Muslims, but we were able to walk up the steps and get an awesome view onto the Temple Mount, right next to the Dome of the Rock. Next we went to the “Kotel Katan” / Small Kotel, one of my favorite spots. It is a different part of the western wall of the Temple Mount, but is smaller and much more intimate, plus you can really get the feel of what it felt like to visit the Kotel before 1967. 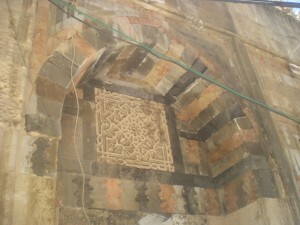 Mamluk architecture in the Muslim Quarter of Jerusalem's Old City. Walking through the Muslim Quarter, I pointed out some of the architectural features, including some of the Mamluk architecture and a sabil — an old Muslim drinking fountain. Our next stop was the Austrian Hospice, at the corner where the Via Dolorosa meets the El Wad HaGai road. We went to the roof for a view overlooking the Temple Mount and to study the topography of the Old City. Downstairs in the garden cafe, I told my guests about a few other spots that we did not have time to visit in full. We discussed St. Anne’s Church and Bethesda Pools, Ecce Homo arch and the church next to it, and finally the Stations of the Cross (of which we would see a number, but not all). From there, we proceeded on to the Christian Quarter, stopping to view some of the Stations of the Cross on the way. We stopped briefly outside the Alexander Nevsky Church. 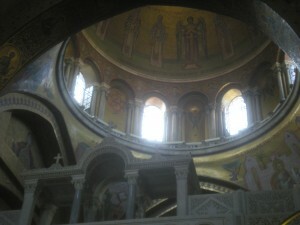 And finally we proceeded on to the Church of the Holy Sepulchre. Outside, I discussed the complex history of the site, and then we went in and I showed them all of the significant pieces of the church. Finally, we walked through Muristan, past the fountain, back through Jaffa Gate and to Mamilla Mall. We ended by sitting in Aroma Cafe and reviewing all of the things we saw over the full day! I think I did a good job of showing them a sampling of all that Jerusalem has to offer, exposing them to various eras, religions, cultures and sites. One of the interesting things for me was to see how the Christian woman seemed more moved at the Kotel Katan than the Jewish woman was, while the opposite was true inside of the Church of the Holy Sepulchre. Not sure exactly what to make of that, other than perhaps that I did my job by exposing these people to cultures other than their own. Did you show them the infamous “immovable” step ladder at the church of the Holy Sepulchre?